Michael Manzi and Joey Lewandowski love a lot of things that many people hate. They love Vin Diesel, a movie star with the appearance and acting range of a ham and cheese sandwich. They love "Magic Mike XXL," a film described by one reviewer as "Oscar worthy, especially for ... the shameless exposure of taut male abdominal muscles." They love Zac Efron, an actor whose name I misspelled twice before fact-checking this story. But above all else, they love Nicolas Cage. The same Nicolas Cage who lost millions after buying two falling-down castles in Europe, and a shark. The one whose recent work includes a movie titled "Ghost Rider: Spirit of Vengeance." "Sure, I understand he can be taken as a joke sometimes," said Manzi, 38, of Waldwick. "I accept that." The same Nicolas Cage whose history of bug-eyed, over-the-top performances arguably reached its nadir in the 2006 film "The Wicker Man," in which he spends 102 minutes screaming at women and investigating a murder that maybe never happened. "This is canon. This is widely considered to be one of his best worst movies," Manzi said as he adjusted his microphone and prepared to watch "The Wicker Man" for the latest installment of "CageClub," a podcast for which he and Lewandowski, 30, have committed to watching every one of Cage's 86 (86!) films. "We genuinely love it." If displaying earnest affection for one of America's most widely mocked movie stars strikes you as a cul-de-sac to obscurity, you are wrong. Starting with a single podcast in 2015, CageClub.me has grown into a network of 18 shows, enough to publish a new episode nearly every day on its own site as well as on iTunes, Google Play and Stitcher. The network has posted more than 500 episodes, attracting more than a quarter of a million plays from fans around the world. 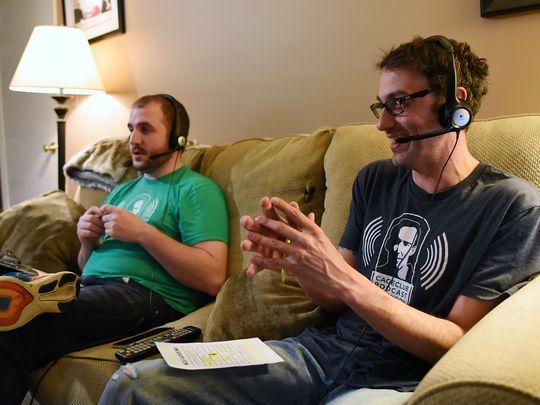 "We thought nobody was going to listen to this," said Manzi, a freelance video producer who records many of the shows in a spare bedroom in his father's house in Waldwick. "We're way bigger than we thought we were going to be." In this dark and cynical age driven by a perpetual outrage machine called the internet, these two men genuinely believe Nicolas Cage - Academy Award winner, crazy-faced actor, bon vivant - has the power to lead us back into the light. "In a lot of the internet there's so much irony. And we try to be as genuine as possible," said Lewandowski, a media consultant who lives in Somerville. "That's why we did the podcast. Because the internet makes fun of Cage, but we genuinely like him." Nicolas Cage is pinned to the ground by members of a bee-worshipping cult. The adherents drop a mesh helmet over his head that is open at the top, and then place a funnel over the hole. "What is it? What is THAT?" he shouts, with his eyes squeezed shut. This makes no sense. To see what's happening, all Cage needs to do is open his eyes and look. Next, a cult member pours a bucket of bees onto Cage's head. "Oh no! Not the bees! Not the bees!" Cage screams, shaking his head violently. "They're in my eyes! My eyes! AHHHHHHHrrbbbghh!" This is perhaps the most infamous moment of Cage's 36-year career. It comes at the climax of "The Wicker Man," a film The New York Daily News described as "shockingly bad" and The New York Times declared "comically inept." If you type "worst acting ever" into Google, the bee scene appears first. Manzi and Lewandowski don't care. Even now, sitting on his father's couch watching Cage's epic freakout, Manzi insists the internet's take is wrong. "People see this and say Nick Cage can't act," Manzi said. "But the whole movie is like this. Out of context, a lot of things are dumb, right?" This idea that popular culture's most ridiculous moments should be understood in the broader view of artists' lives and careers undergirds CageClub's entire worldview. "I mean, we know this movie is not good," Lewandowski said. "But we're saying it's not bad. And there were interesting choices made, and Nick Cage is committing to certain things. Maybe that's not good. But it's fun." Lewandowski and Manzi have been remarkably consistent about their views of "good" and "bad." Both studied film at Ramapo College, but they didn't meet at school. Independently, neither exhibited any interest in the classics. "I've never seen 'Lawrence of Arabia.' I've never seen 'It's a Wonderful Life,'" Lewandowski said. "But this is the third time I've seen 'Wicker Man.'" But if it involves schlock, strange editing and bad acting, Manzi and Lewandowski are down. "Right from the beginning their taste was pretty clear, which is pretty unusual for undergraduate students," said Tobin Addington, a screenwriter and film professor who taught both men at Ramapo. "They were the kind of students who embraced their own quirks." Years after graduation, Manzi and Lewandowski met through mutual friends on Facebook. That's where Lewandowski posted his plan to watch every Nicolas Cage movie ever made, in chronological order. He started big, dropping $110 to buy 12 Cage movies at Best Buy. "I was like, 'Why are you so Cage crazy all of a sudden?'" Manzi said. They agreed to watch the films together, record a podcast and write a review about every one. When they finished, they started again. "We both have movie OCD and movie completionist tendencies. It's pretty unhealthy," Lewandowski said. "We're not doing it with the hope that one day this could be a career. We just want to watch Nicolas Cage movies over and over." Starting with fellow Ramapo graduates, the "CageClub" audience gradually spread around the world. Fans in England mailed Lewandowski sketches of Cage in four different movie scenes; a fan from Spain sent an issue of his full-color, Cage-themed zine. Manzi has no reason to believe that the "CageClub" listenership has grown to include the star from whom it takes its name. "I think he's on a whole other stratosphere," he said. "I don't think he even knows what podcasts are." The closest that Manzi and Lewandowski have come to meeting their hero was last July, when Marco Kyris, who served as Cage's stand-in for lighting and camera setups on 19 films from 1994 to 2005, appeared on their podcast. In the fall of 2016, "CageClub" grew from a single podcast into a network of like-minded shows. The timing was accidental, but possibly meaningful. Just as social media devolved into a spiral of vitriol and racist rants, Lewandowski and Manzi expanded using a Web 1.0 model, leveraging the internet's reach to connect with fellow obsessives and weirdos. "The internet is mostly dark," Manzi said. "We're trying to use the internet the good way, to communicate with people over great distances and talk about things we love together." Current shows include "Winona Forever," a podcast dedicated to celebrating "the entire filmography of Winona Ryder," and "2Fast 2Forever," whose hosts plan to watch a film from the "Fast & Furious" franchise every month till the end of time. "When you pitch a show to Joey and Mike, they want to know if you'll bring an interesting point of view that isn't making fun," said Addington, who co-hosts "The Contenders," a show on CageClub.me that focuses on trailblazing women in film. "The idea of an unironic podcast network is unusual. They're more interested in building a community that will be earnest without being naïve."